Murray State University President Bob Davies kicked off the Friday Board of Regents meeting with the quote, "The hope of democracy depends on the diffusion of knowledge," which is carved above the grand doors of Pogue Library, where the meetings are held. Davies said there has been "constraints and stresses" on higher education and accusations that college campuses are not bearing 'the hope of democracy.' Davies credited Murray State faculty for not "telling people what to think" but helping people learn how to engage with others on civil dialogue and a better understanding of society. He said MSU faculty "embrace the marketplace of ideas" and celebrate differences and opportunities to engage. Davies said the performance funding bill making its way through the legislature mirrors the model discussed at the last board meeting: 35% based on student success (number of bachelor, STEM, minority students, student progression), 35% based on credit hour production, 30% on budget items related to the academic unit. Vice President of Finance and Administrative Services Jackie Dudley presented the Treasurer Report, which found a projected shortfall of $6.5 million at the end of Spring. Dudley said Summer tuition revenue could reduce that amount by a couple million. Thus, Murray State University is estimating a $4.5 million budget shortfall in this year's budget due to a decline in tuition and fees as budgeting for next fiscal year gets underway (more on this story here). Dudley stressed this is a preliminary estimation based on current (January) numbers and could change. Enrollment impacts tuition, Dudley said, and a summer goal of $3.6 million is critical to bringing the shortfall down. She also noted expenditures out of the reserve accounts and the impact of pension systems liabilities provide challenges before the year end. While expenditures this year are largely the same as previous years, revenue from auxiliary services are down, notably in housing occupancy where the fall counted for 87% versus 76% in the spring. The Foundation accounts, however, are in a "much better shape overall from last year." As such, Murray State is considering a budget with an approximate $4.5 million shortfall. Board Chair Stephen Williams says the Council on Postsecondary Education has issued guidance for a tuition cap of 3%. He says that is one factor that will be taken into consideration as the university develops the next budget. “We are very, very sensitive to any increases in tuition and want to minimize that while at the same time being financially responsible for the university both in the short term and the long term," Williams said. Williams called for a special meeting in April to address tuition. He says performance funding, pension liabilities and other federal and state level actions will also determine the next budget. The board will present and approve the budget for fiscal year 2017-18 in June. In determining budget guidelines, Davies listed several factors, which take into account a slight decline in enrollment (not necessarily from the current class of freshmen but in the retention process - graduate numbers are down). Projected enrollment decline of $4.5 million acts as a starting point, Davies said. Davies said the next budget should include a cost of living adjustment and continue to phase-in an effort to increase the wages of the lowest paid employees. The next budget should also include an effort to attract and recruit diverse faculty and staff, he said. As for students, he supports the Commonwealth Honors Academy, first-year experiences and other programs enhancing recruitment and retention. Maintenance will need a higher budget (noting the recent steam issue that appears to be resolved, Davies said that was part of deferred maintenance and the university will consider options for long-term capital projects in this regard). The university should invest in experiential learning programs, technology efforts, advertising and marketing. In generating revenue, Davies listed entrepreneurial efforts like repackaging the skills of the campus community and finding opportunities through those talents by working with local businesses, for instance. Going into specifics, Davies said he wouldn't commit at this time to salaries and wage increase, but noted that as an example a 1% raise would amount to around $830,000. He said the program to increase the lowest paid hourly employees totals around $290,000. There are also fixed cost increases like retirement pensions of an estimated $100,000. Healthcare determined by calendar year: $381,000. Other factors include utility rates on large buildings coming online and insurance going up (liability and property, legal service, cyber security). While performance funding is set to go online this July, Davies said there will be no appropriation increase or decrease (the state budget is set every two years). Murray State will go into performance funding where 5% is taken off the top and put into the pool. Davies said, "under all of the scenarios we've seen so far, we'll come out about even." The university is not committing to a tuition increase at this time. For reference, Davies said 1% increase accounts for about $790,000 in revenue. 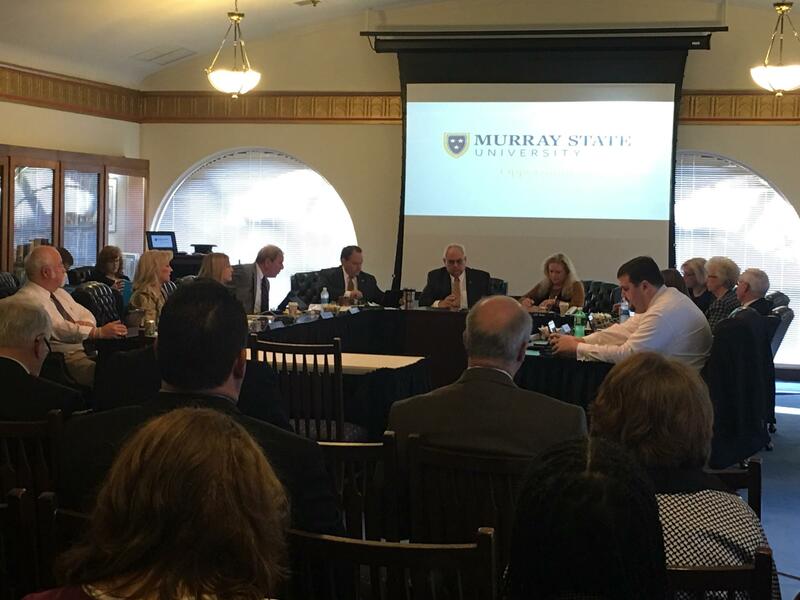 Work groups are underway on a CPE cap, which will be approved at the end of March (though the CPE has floated around 3% in phone calls to Murray State officials, according to Williams and Davies during the meeting). CPE is working on a model for university caps and each will have a slightly different cap based on tuition levels. Davies said he is sensitive to tuition rates and that it's important for MSU to remain affordable but also provide value of services to students. To note, over the past 10 years budget appropriation from the state has declined 19.5% while the expenditure and general (E&G) budget increased 22%. Tuition revenue has increased from $48 million to $79 million. Inflation cost went up 16.3% and other revenues increased by nearly $2.3 million. Student population increased by 9%. In that same time period the number of employees increased by 19 [note: it was unclear if this number accounts for the number of layoffs over this time period]. A special meeting will be held at 9:30 on April 21 on the same day as an opening showcase of the engineering and physics building. The Board considered options to reform or outsource healthcare and mental health services for students, faculty and staff, based on recommendations from consulting group Hodgkins Beckley on Friday. Options include increasing the budget for services provided, outsourcing services to a contracted health provider as Western Kentucky University has done, shifting costs out of the budget by adding a mandatory fee of around $150 dollars per student or implementing insurance and Medicaid. The survey found positive feedback from students, faculty and staff about the service and quality of health services and found a desire for continued service on campus. It noted widespread use from faculty and staff, which was higher than at other campuses. It also found a lack of mental health care services in the community. Conversely, it pointed out limited operations and services (women's health, psychiatry, injections, immunizations, health promotion, etc.). The survey found the counseling center focused more on long-term care than shot term compared to other campuses. There was also a lack of a counselor specifically for drugs and alcohol. MSU health services currently cost around $925,000 a year: $529,000 for health care and $396,000 for counseling. The board weighed pros and cons of six options as presented. The first option increases the budget of health services and offers more services, nurse practitioners, hours of operation, etc. - This would be a large investment in health services. The second option reduces the budget and operations and offers limited service. Students would pay $15 per visit and urgent care services off campus that accept insurance would be of no cost. This option would also discontinue employee care. The third option outsources health services but keeps counseling services on campus. Urgent care clinics would be contracted to come on campus to operate services. Students would pay for the visit or use insurance or Medicaid. Employees could use insurance. While this option would significantly reduce costs, there would still be some cost the university attached. Western Kentucky University has a model like this one. The fourth option outsources services, provides funding for short term counseling, health services would be based on insurance. This is different than the third as it's more insurance-based. The fifth option is to apply a fee of approximately $149 per student to allow them to receive health services. This is the amount needed to cover option one. The net cost to the university budget would effectively be zero as the money would come from students. With a headcount of 9,500, this would make the yearly revenue $1.4 million. Regional campuses would be excluded. Faculty and staff could choose to pay into this option. No insurance would be involved. Jackie Dudley suggested the fee could be a part of 'mandatory fees' students pay each year, which is currently about $43 and coveres a variety of things. The sixth option is a comprehensive college health program with insurance reimbursement. Students would be required to have health insurance on this option. Student Regent Clint Combs said students are against such a requirement. Telehealth services were also discussed, where someone can get basic medical advise by phone instead of visiting a clinic. The board and President Bob Davies agreed health services were important to have on campus in some capacity. Regent Chair Steve Williams said the presentation was "food for thought" and offered a starting point for further discussion. Another consulting group made recommendations for auxiliary services on campus. These findings came from MGT Consulting Group and Porter Khouw Consulting. Aux services are business enterprises that operate on campus (printing, dining, housing). These items were presented as an open discussion moving forward. Housing: explore outsourcing residential hall custodial and maintenance staff, retain operational control of residential life program, institute a marketing plan, develop sorority housing. University Store: Continue to operate as a self operated store as it's returning $350,000 more than an outsourced store. Shift the book rental program to allow faculty freedom to select texts without a three-year commitment, eliminate trade books and keep best-sellers and campus authors, add a tech chop, add parking meters outside for community access, add Racer Card ability to store, use websites and social media to generate sales. Print Shop: Consolidate Copy Express and current print shop location, eliminate offset presses, modify envelope printing, focus on graphic design work. Dining: To retain a self-operated dining option using franchise partnerships, retain All-Access meal plans, extend hours for Winslow and increase menu options, eliminate late night weekend Pony Express hours and reduce Stampede delivery times. General: Establish a new auxiliary director position with oversight responsibility for operational and business functions of these enterprises. SB107 - Board bill - Grants the governor broad power to remove board members if a board is lacking racial and political diversity or overhaul an entire board if there is "dysfunction." Davies said Murray State's board is in compliance with the guidelines set forth in this bill. HB152 - Teaching certification bill - Would do away with current requirement that teachers need post-baccalaureate requirements. Governmental Relations Director Jordan Smith predicts this bill will be abandoned. If passed, though, it would be a hit to Murray State's teaching programs. HB206 - Dual credit bill - Codifies the language from previous dual credit measures. Smith says there hasn't been movement on this and believes Governor Bevin may sign an executive order on this. HB249 - Concealed carry on campus. Smith said this would probably not pass. There may be more community input on this bill for possible future legislation. HB501 - Post-secondary immigration bill. This is related to sanctuary cities and universities. It would prohibit public universities from enrolling, employing or contracting "illegal aliens" and could withhold public education funding if non-compliant. If this person is enrolled or employed and is arrested for a crime, the provost, president and board could be held accountable. Smith said this bill could get a hearing. The board voted to proceed with developing a fine structure for incidents involving alcohol use based on severity in on-campus student housing. In this structure, the first offense could be $500 if alcohol is served and if people under the age of 21 are involved. The board considered numerous scenarios, one involving a party in a cohabitant room, or if a space is rented to someone. A person found to be 'most accountable' would be determined by the residential advisor who would write-up the offense to go before a hearing officer. A second offense would notify the parents. The board questioned the role of The Family Educational Rights and Privacy Act (FERPA) and student privacy in this measure. If a student is under the age of 21 and given alcohol is being consumed then it could be considered a 'health risk.' There was debate as to whether or not it was a health risk for alcohol to merely be in the room. Also, it was suggested that students and parents be educated on this measure. As for FERPA, a release form upon enrollment would cover potential issues. Provost search: March 6 deadline for applications. Davies said the pool is "deep and wide"
Iwis donated an electric car to the MSU Institute of Engineering. This car was showcased outside the meeting.